This basket was created by a Chumash woman living in California in the early 19th century. It is one of the few works created in Spanish America that was signed by an indigenous woman. The form and iconography of the basket suggest it was made as a gift or for barter rather than use in the Chumash community. The full inscription along the rim reads, María Marta, neofita de la mision de el Serafico Doctor San Buenaventura me hizo an("María Marta, neophyte in the mission headed by the seraphic Doctor San Buenaventura made me, [in the] year…")—the year did not fit upon the basket’s rim. The basket lifts the design of the Spanish coat of arms repeated on its sides from coins and this is not the only Chumash basket of the period to do so. María Marta (ca. 1766-1830) wove this basket in the early 19th century, probably around 1822. Marta was a Chumash woman who resided at the Franciscan mission of San Buenaventura in California. It is likely that friars on the mission encouraged such basketry. The work is extraordinary, nonetheless, as a very rare example of works from Spanish America to have been created and signed by an indigenous woman, and to survive to the present. The basket was woven of local fibers, in patterns well-known among Chumash weavers. Marta drew the pillar motif and emblems of Castile and León from Spanish silver coins. 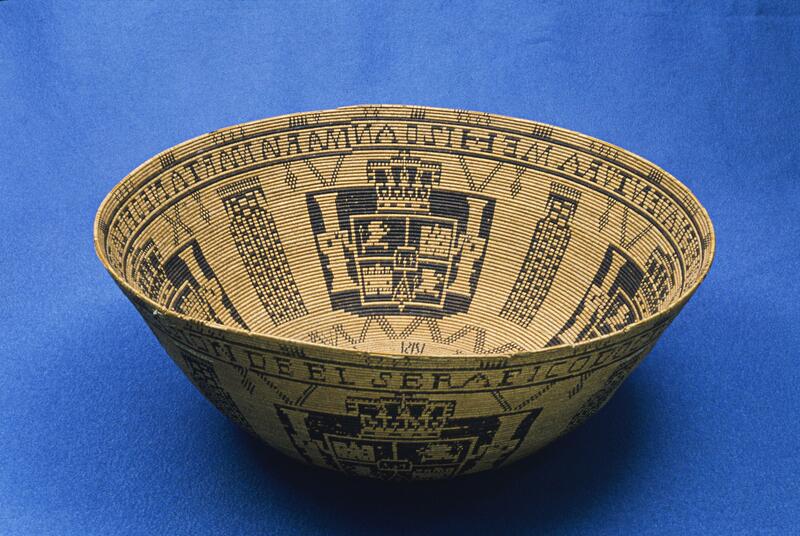 Created in the northern reaches of New Spain, on a Franciscan mission, this basket may have been made as a gift for a visiting Spanish official. If so, the basket nevertheless made its way to market in the early 20th century. It was collected in Mexico City by Zelia Nuttall, a famous scholar of the pre-Hispanic and colonial history of Mexico. Since 1920 it has been housed in the Phoebe A. Hearst Museum of Anthropology in Berkeley, California. At the time this basket was made, Chumash people were living in, or under the aegis of Catholic missions. And their baskets became highly-admired, often purchased, collected, or offered as gifts.Unlike so many works in Vistas, this one was not made within a guild or a male-dominated workshop. Rather, basketry, like other arts practiced by indigenous women, would have been taught informally within the household. As such, the basket is a type of artistic production (small-scale and domestic) that stands at the other end of the spectrum from works produced en masse in large guild workshops. Courtesy of the Phoebe Apperson Hearst Museum of Anthropology and the Regents of the University of California, 1-22478. Leibsohn, Dana. 2015. 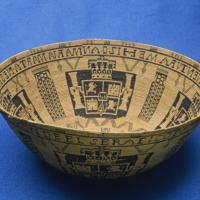 "Exchange and Value: The Material Culture of a Chumash Basket." In Writing Material Culture, ed. Anne Gerritsen and Giorgio Riello. Bloombsbury: Bloomsbury Academic Publishing. Phoebe A. Hearst Museum of Anthropology. “Presentation Basket.” In A Century of Collecting: Beginnings: The Phoebe Hearst Era (1901-1920). Timbrook, Jan. 2014. "Six Chumash Presentation Baskets." American Indian Art Magazine 39 (3): 50-58.